The use of dried and smoked fish is an important part of the diet of many poorer communities with access to fish either marine of fresh water. Emeka Okafor of Timbuktu Chronicles, a really good blog with a focus on business successes in Africa, presents some technical information on fish smoking and drying. Drying and Smoking are two critical technologies for those who have access to fresh fish which they wish to process and store for later use. They are critical technologies for resource poor people and cheaper and more environmentally sustainable than freezing, chilling and canning. The first video is a bit of an eyeopener and actually focusses on potraying the existing processing of waste fish parts from a Nile Perch processing factory on Lake Victoria in Uganda. The second by the Kenya Marine and Fisheries Research Institute is an introduction to fish smoking from fish buying to dried fish storage. 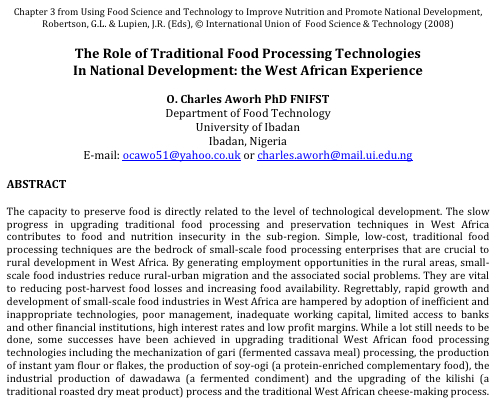 This entry was posted in ..Agribusiness/tech, .African Development, Development, Energy, Food Processing, Market /Business, Technology and tagged fish, marine, smoking, solar drying, West Africa on December 23, 2010 by admin.